If you were involved in an accident and did not follow these guidelines, a car accident lawyer can still help you. Don't hesitate to contact the team at Lynn Harris Law for a free consultation with a qualified auto accident lawyer â€” no matter what your circumstances are, we can advise you of your legal rights. When an event with the magnitude of an auto accident befalls you, itâ€™s best to ensure that your legal rights are supported by knowledgeable and experienced attorneys. When you consult Provo personal injury attorney Lynn Harris, you will speak with a lawyer who understands the law and the impact that such a life-changing accident can have. During your consultation, we can discuss the circumstances of your case in full detail, and you can feel confident knowing that we treat each case as our most important case. 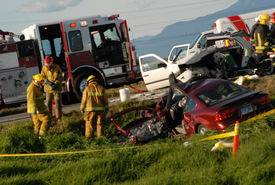 If you have been involved in a car accident, our auto accident lawyer assists clients throughout Utah. We can assess your case and help you resolve any legal issues that have arisen. Contact our practice for a case review today.